With another Canadian winter almost behind us, and the opportunities of Spring finally in the air, I am very pleased to bring you another edition of Private Capital Markets - the national magazine of the Private Capital Markets Association of Canada (PCMA). As we begin 2015, I am happy to report that the PCMA continues to grow and is more energized and focused than we have ever been. I hope you enjoy this edition of Private Capital Markets and the enhanced digital publishing platform that has brought together every article from every previous edition into a searchable library of sophisticated industry analysis and advice. 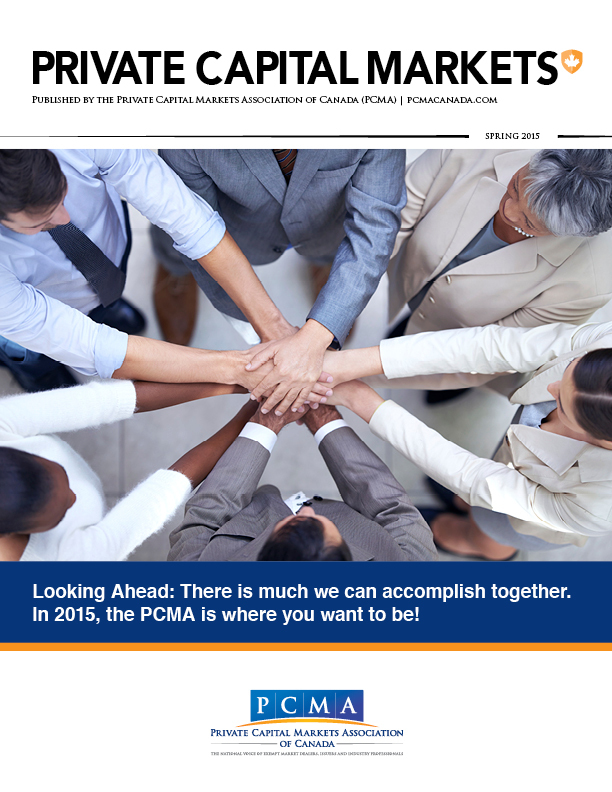 If you are interested in writing for our next edition or advertising please contact Elena Mazur: elena.mazur@pcmacanada.com by July 1, 2015. Find the industry audience you were looking for – our advertising rates are on page 5 here. PCMA Members receive a special price on print advertisements. I look forward to seeing you at our Annual Conference on May 19th in Toronto. We are very pleased to announce that the Hon. Joe Oliver, Minister of Finance will open the conference with a keynote address on the private capital markets and its impact on the economy. You won’t want to miss this one!